Mary the Nebraska Realtor found this house. The listing is one of those "slowly growing dread" ones. It starts out with a cute-as-a-button bungalow, then the interiors become more and more trashed, and finally we end up in the basement where -- if I'm seeing this correctly -- a bulging Hellmouth is about to open and bring forth the end of the world. Tra la la. And note, as a bonus for you personally, there is a tentacle starting to come through the ceiling by the window. You know, for that extra touch of skeeviness. I actually live in a house that had the bulging basement when I was a kid. I'm still mad at Dad for making us live there....but I'm not bitter or anything. Ah, there's nothing like a good tentacle. "Here's a project for you!" How honest can one get? And that's a huge project by the way..
Who says there's no affordable housing anymore? Hellmouth indeed. Who's calling Buffy and Giles? But, I really liked how cute the house was from the outside. I was thinking, oh, for the age of the house it's not bad. The problems with the plaster are to be expected, and the floors need to be refinished, and oh look the bathroom has its fixtures still (unlike most cheap homes) and hasn't been gutted for copper pipe, and the backyard just looks a little overgrown, etc. Maybe it's worth the repair expense to own such a cute place. 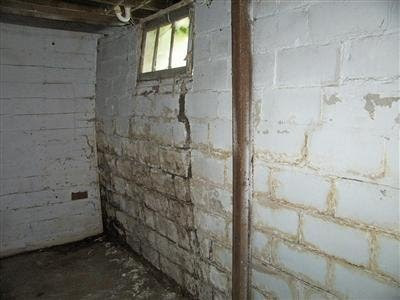 Yeah, then I saw there were multiple bulging walls in the basement. And the siding outside where it was apparently replaced (?) between two windows. Makes you wonder about this house's story. I'll have you know that the cask of Amontillado behind that wall is just amazing. What good is a newer furnace and roof, if it looks like the foundation is about to collapse? Better enjoyed from the exterior. Safer too. The cask of Amontillado reference! YES! I will use that from now on every time I show one of these treasures. I love all those builtins and it looks so much like the flat I was living in when my husband and I fell in love. (We were roommates first, then we got to know each other.) Man, we loved that place. Nostalgia can be expensive, I'll have to be careful. i was thinking.. boy this has a ton of potential. and then i got to the basement pics. and i finished my sentence...to fall down and kill us. Mary: do you ever show any non-scary houses? I'm contemplating moving to Omaha, and I'm not sure whether I should try to get in touch with you or run away while I still can. That's just plain scary!!! I'd take the picture & run afraid it was ready to bust through!!! And I would give a great deal for those built-ins too. And for the windows, in case I need replacements (they're identical to the ones in my house). This worries me - I showed this house to my husband, and he said that if he lived in NE, he'd be very tempted to buy it and fix it up. He mentioned something about lifting the house up and putting in a new basement (apparently a trivial maneuver - who knew? ), and then refinishing those lovely floors and woodwork. Oh, and bathroom and kitchen - but definitely resell at a profit. Quick! Call for reinforcements. They've got a battering ram. And they're breaking in!